Thread: Vintage Mego Figures Dead? Is it dead? I ask because technology is available to produce exact replicas and with 3D technology it is near impossible to distinguish between vintage vs replica. I collect GI Joe and MEGO, but the reproductions are so good that I have see a ton of reproductions being sold as vintage and now boxes and figures are being aged to make it more difficult to tell. I am ok buying a repro as long as I know it is one, but I am so frustrated and inclined not to purchase any more vintage figures for fear they are fake. What are your thoughts? "The farther we go, the more the ultimate explanation recedes from us, and all we have left is faith." Because our generation is getting older Mego mania was bound to wane. Actually, I think this is a great time for remakes and reproductions --- It gives the tail-end people that always wanted a real Mego Romulan a chance to get one - in OFFICIAL reproduction form. I suspect in the future only vintage MOC Megos will hold any value --- But, there will be inevitably less people that would want them. While I truly love the New Megos...I wouldn't exactly call the "perfect reproductions." Just compare the original Mego Kirk vs. the new one...it's seriously OFF. 3D printing won't be a factor. The reproductions made of the Pirates, Monsters, Knights and whatever else and the originals still bring good money. The Great White Shark by FTC was better than any amateur could make with a 3D printer and the mego version is still very expensive. 80's toy demand seem to be at an all-time high. I'd say age of the buyers will have more to do with it than anything else. But that's not always the case the GAH show is an all but dead property but that damn bug playset will still go for over a thousand each time. Last edited by Mr.Marion; Feb 9, '19 at 11:01 AM. I think from my perspective, and someone please point out examples if I'm wrong... the one thing that seems really hard to perfectly replicate is the silkscreened fabric. CTVT seems to have a more synthetic feel, and isn't tailored to fit as snug as an original. I think I've seen a few cases where they've improved, but fabrics are tough to match I think. Much more so than plastics or vinyl pieces. I get what you're saying though. I managed to collect most of the WGSH loose from a member here who I trusted. I think that is probably the best way to ensure authenticity. That, or Mego Meet sellers. I don't think so. I have as great a passion to collect original Mego figures and playsets today as I've always had. I don't feel anyone has produced an exact replica yet and never will. Times are just too different these days. I mean, we have bodies from FTC that won't stand to save their lives and Mego figures 40 years old doing just fine. My Cheetah won't stand and my Sinestro and Scarcrow on that "Shaggy" body are worthless. Even the "new" Mego has issues. My Jeannie and Endora won't stand because if their ankles and shoes. Don't get me wrong. I'm glad Mego is back and giving us more (along with FTC). But it was never going to be the same as is was 40 years ago. I'm a diehard vintage Mego collector and 34 years old. I'll hopefully be collecting for the next 30 years. I still experience a lot of competition for figures on eBay. There was a huge explosion of interest with the Facebook groups. There is also a lot of crossover with other interest groups that bring in new collectors. Vintage Megos are not at the height they built up to in the late '00's and early 10's. Their popularity, however, inspired the very thing that has "lessened" them. Incredible repro's led to Emcee and FTC and ultimately the re-launch of Mego. 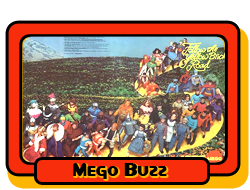 ReMegos are the children of Mego, almost a continuation of the vintage line. Yes, vintage Megos may not demand the prices they once did, but those prices were never inherent. Vintage Megos will continue as long as people like us continue to collect them. Yeah but outside of a couple carded WGSH which megos aren't selling for all-time highs? Hasn't vintage Mego been dead since they went out of business in the 1980s? I mean, there's new figures but it's not like anyone is going to confuse the two. Even just the change in plastic alone, had they been perfect replicas, which they aren't, would be a giveaway that they are newer.